I had originally planned to walk the PNT this year. After deep thought; during many rainy days this winter, decided that my ONP bucket list takes priority. Created a mental catalog of all the places I wanted to visit here in the Olympic Mountains through the years. Did not want to put this the list off for future years and was a greater personal priority than other options. Visiting some of these areas for the first time and revisiting a few of my favorites. Mount Olympus at sunrise. Views from camp during my 2012 solo traverse of the Bailey Range. Would really like to see all the seasons change; from snowmelt, to spring flowers blooming, blueberries ripen, Black Bears move into the alpine, autumn color change, Elk going into rut and then snow starting to fall again. I really don't want to walk super long distances per day. Feel like I missed a lot last year by trying to hurry to the next campsite destination. Taking time to experience what is around me and capture that experience through photographs. I feel like fitness and staying active is the biggest part of a successful adventure. When you take someone out of an office job and expect them to walk over mountain passes; without giving their body time to acclimate to the task of forward movement; which is is the most natural thing a human can do, it sets them up for a negative experience. I'm a firm believer that one should replicate hiking with only walking outside. Not a fan of exercise equipment whatsoever, their original purpose was for physical therapy and do not allow you to simulate necessary stability muscles needed on the trial. Want to train for a trip? You need to be walking outdoors, no exceptions. Will admittedly say, that I'm not in as good of shape as last year at this time. Focusing more on recovery and prevention this season. Felt I over did my pre-training in 2012 and did not feel 'fresh' going into the journey. Trying to practice the theory that less is more. Only getting in the bare minimum of walking that should be done to keep my maintenance. Though the weeks I have been 'ramping' toward the total mileage and elevation changes that will be required daily. Trying to keep 3,000'+ ascent per walk. Focusing on form and breathing, not speed. Dec - Jan 12/13' : 1 hike and 1 bike per week. Feb - March 13' : 3 hikes per week. April - June 13' : 3 hikes and 1 backpack trip per week. Peeking into the Bailey Range from the Elwha drainage. I will be using the PNT as the 'highway' to get me to various places. It goes through well maintained areas of the ONP, such as the Elwha Valley Trial. This will make it easier to carrying several days worth of food to access remote parts of the Park. Not going to detail the exact itinerary until after I pass through the area. Would like to keep each campsite out of the public eye and is a good rule of thumb for personal safety. Will tell you I plan on visiting the coast, every major river drainage, sleep in remote basins, spend a few weeks off trail and grab a few non-technical peaks along the way. The best part of setting up something like this, is that no one has ever done your exact path. I'm happy to share all my research by request; after I've finished of course. Shoot me an email this winter. 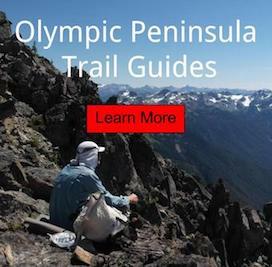 1,200 mile trail that runs from Glacier NP through Olympic NP; ending at Cape Alava. Going to keep my pack weight as light as possible, but not so minimal that causes me to be uncomfortable in the conditions Each area and time of year has slightly different equipment needs. Plan on coming back to my storage in Port Angeles, during several different resupply points and switching various items. Check out my gear list below. 2013 Gear List. Some items get not used is some areas or conditions. For the first 2 months, I will be walking alone. Don't mind it at all. I enjoy deep thoughts that isolation provides. Find it a pure way to experience wilderness. Plus, don't have to worry about things getting knocked on you and less likely to take risks, over walking with a partner. The added freedom of setting your own pace, pitching and breaking camp on an independent schedule. I will be meeting up with various hiking partners in town, during the month of September. By then, it probably will be nice to have conversation with humans. My partners have various backgrounds and are from various States. Look forward to put them all together in the wilderness. Some of them are also bloggers and it will be interesting how they translate their personal experience in the Olympics. Food is the most challenging part of this route. One simply just can't carry 3 months of food on their back, so at some point a restocking is needed. The average trailhead is 20 miles from any town, so that makes it challenging. I simply can't just walk into town from the trial, it can take up to 24 hours before I'm walking again. One has to account for this in the trip planning. Being a minimalist food and water is the most heavy items one carries. So I set it up in a spreadsheet schedule of times that I will need to go to town. 9 times total. The most time without seeing groceries is 11 days. I will be relying on my own two feet, the bus system or the generosity of others for trailhead service. Grocery stores in my route will be; La Push, Forks, Amanda Park, Port Angeles and Sequim. Plan on shoving my face with extra calories while in these places as well and charging camera batteries. I have high hopes of remembering this for a lifetime. It's all in part of my 'reverse retirement plan'; have fun now and work later. The modern human has it all wrong. Hope to have the images of endless flowers in an alpine meadow and sunrise bouncing off a glacier, burnt into my memory banks until I die. Know when I returned last year, it was all that I thought about all winter. There is no better feeling ; than to have all belongings on your back and seeing different lands everyday. What an incredibly free feeling. It is very addictive. Can never see myself working a job during the summer and not being in the mountains. Last year all my time off the trial was spent behind a computer in various towns. Blog writing and photo editing is very time consuming for me. I'm going to avoid eating up that free time at all costs. Will focus on writing things in detail when I return, after the snow starts falling again. Plan on seeing short updates right here on the website; during resupply and around a public computer. Also look for it on Facebook as well.